(Nanowerk News) It can shift from red to green to violet. It can mimic patterns and designs. And it can do all of this in a flash -- literally. The same qualities that define the cuttlefish -- a sea dweller that uses its powers of dynamic camouflage to survive and communicate -- also apply to a new engineering feat that behaves much like nature's master of disguise. A team of UNL researchers has developed a structure that can begin replicating color and texture within seconds of exposure to pulses of light ("Color and Texture Morphing with Colloids on Multilayered Surfaces"). The new design responds to much lower-intensity light and at faster rates than its few predecessors, said Li Tan, associate professor of mechanical and materials engineering. 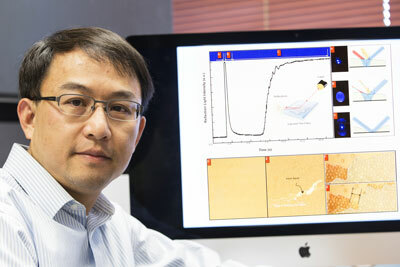 "This is a relatively new community of research," said Tan, who co-authored a recent paper outlining the team's design. "Most of the people (in it) are inspired by the cuttlefish, whose skin changes color and texture, as well. "Changing color is relatively easy; a TV can do that. Changing texture is harder. We wanted to combine the two." To do so, the team has created a structure consisting of three layers: a base that insulates against heat, a middle that readily absorbs light, and a top made of either a liquid or solid. Paper, glass, foil, silicon and other materials have all proven suitable for the middle layer, so long as it includes a distribution of colored pixels. The middle and top layers also contain colloids: microscopic particles of soda lime, glass or copper. When a moderately intense laser strikes the middle layer, it begins warming any pixels that absorb it -- that is, those that don't share the light's color. Through the process of convection, these localized increases in temperature trigger ruptures along the surface of the top layer or volcano-like eruptions within it. In both cases, the resulting suction draws the colloids toward the heated, light-absorbing areas -- thereby reproducing the color that shines upon the surface. If the light is red, for instance, the colloids migrate to cover green pixels and leave only the red exposed. Under violet light, the particles obscure the majority of red pixels while leaving most of the green uncovered. This same photo-thermal principle allows the team to replicate or create patterns, Tan said, either by directing lights in deliberate trajectories or simply flashing them through transparent images overlaying the structure. The team has used these techniques to write words and mimic checkerboard patterns, among others. When the top layer is a solid, cooling it will obscure the word or pattern, which reappears upon reheating. According to Tan, the design's first apparent application -- camouflage -- probably won't see the light of day for a while. The more immediate potential application, Tan said, relies on the photo-thermal principle that drives the design's color and texture changes. In the same way that the technique can direct the assembly of microscopic colloids, it might also accelerate the accumulation of cells and facilitate the growth of biological tissue, he said. "Starting from small building blocks and growing them into large structures usually takes a very long time," Tan said. "In our case, it really doesn't."